Eastern Scottish had a batch of Bristol RE's for the Edinburgh to London service. 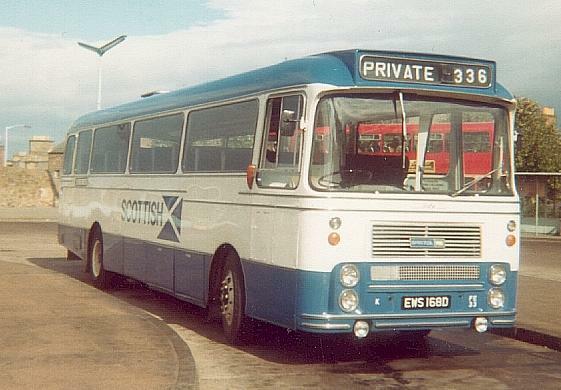 Two of them, including FE33 (EWS168D) seen at Kirkcaldy in September 1978, went to Fife at the end of their careers. This vehicle now languishes in a shed at the Scottish Vintage Bus Museum awaiting restoration. Some English operators bought Y-types, such as Premier Travel of Cambridge who took batches of two AEC Reliances for many years. Their VER262L, a most unusual 12m example is seen in Cambridge bus station in July 1980. This vehicle is currently being restored at the Oxford Bus Museum. The Alexander Y-type was the standard body for single deckers in Scotland for 20 years. So it's not surprising that a considerable number are now finding their way into preservation. They were mostly built on Leyland Leopard chassis, but some AECs, Albions, Fords, and Bristols were also constructed. There were also alot of Seddons. This article takes a brief look at some of these Y-Types. An ex-Northern Leopard, GSO80V has just been bought for preservation by John Grant and Robert Gray. It has a most interesting history having operated for all three Alexander companies (Fife, Midland and Northern) and Highland. It finished its active service with Henderson. 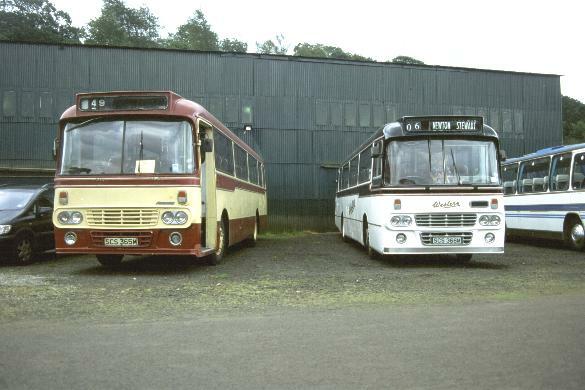 Above left: sister L16 (GSO81V) with Highland but on loan to Fife in Perth bus station in July 1982; above right: GSO80V as Fife FPE196 in Dundee bus station in April 1985. Reunited for the first time in 20 years at Lathalmond in August 2002 were former Stranraer Leopards SCS365M, now with a preservationist in Macclesfield, and SCS366M already preserved at the Scottish Vintage Bus Museum.